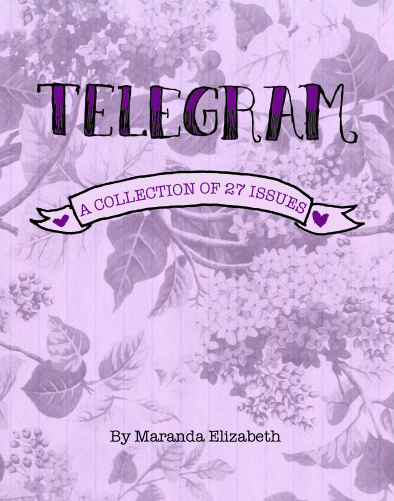 My twin and favourite writer, Maranda Elizabeth, will be in Montréal tomorrow to launch their new zine anthology, Telegram: A Collection of 27 Issues. The book was published recently by Mend My Dress Press, and has already seen launches in Toronto and Guelph – with Peterborough, Ontario to come and then a tour of the US West Coast. This is your chance to see them reading at the Ste-Émilie Skillshare, alongside friends Hayden Slays and Kit A. (Facebook event here). When: Sunday January 13th, 2-5pm. Where: Ste-Émilie Skillshare, 3942 rue Ste-Émilie (métro St-Henri). Who: Maranda Elizabeth, Hayden Slays, Kit A. and Fight Boredom Distro. What: Readings, conversation, inspiration. Probably snacks. $: The event is free. Copies of the book will be available for $25 and zines will be available for $1-$5.00. Yelle lance aussi Télégramme #24, la traduction française de Telegram #24 qui inclut les articles Yelle Yelle Yelle Bla Bla Bla et Comment Être un.e Bon.ne Ami.e d’une Personne Cinglée. Le zine serait disponible via le Etsy de Maranda et Mad Pride Montréal. 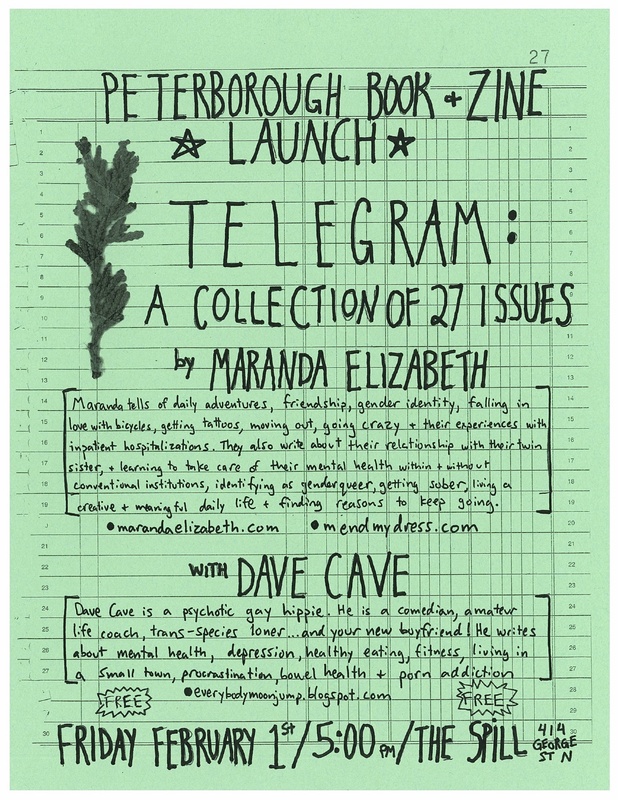 Don’t forget to check out their launch at The Spill in Peterborough, Ontario with one of the funniest people we know – Dave Cave of Everybody Moon Jump (Facebook event here) – and keep up with their tour online. The book will also be available via Fight Boredom Distro in the coming days – keep up with the news here. I wish I could hear Maranda reading from their book. I bought a copy through the UK amazon and I’m enjoying reading it.